Paula Snyder - Second Studio: Oh to be six again! When was the last time you got such a cute easter basket. My granddaughter Iris is six, I think she'll be a happy girl. 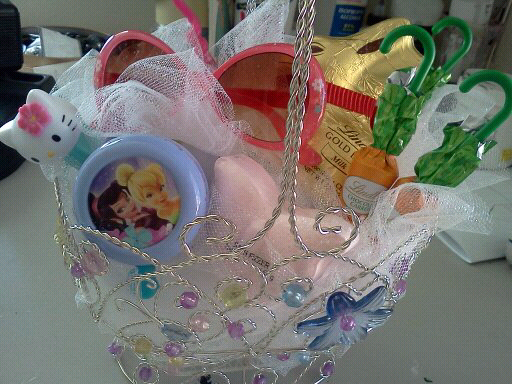 A bike bell, butterfly bath fizzie, sunglasses, hello kitty pez, barbie toothbrush, and of course chocolate! I used tulle instead of that grass that the cat eats and throws up in front of the dinner guests. Instead there will be glitter everywhere...a reasonable trade off don't you think? The garden is in full on grow mode. I noticed barn swallows for the first time yesterday. Even the little lizards are out and around. How goes it in your world? I bet she loved it, I know my granddaughters would! I was six once and oh so creative !!!! Today is the day to say YES !!!!! Omg, how cool is this!